“About this time the Citizens Council had been organized in Indianola and quickly spread throughout the state. At first we did not pay much attention to the organization and little realized the role theywould play in the years to come. 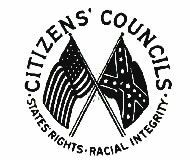 The Citizens Council was not like the Ku Klux Klan. Its members did not advocate violence but had as their goal a strong fight against any form of integration. It was made up of bankers, businessmen, lawyers and most of the town’s leaders, and in many ways they had more influence on people’s feelings and attitudes than did the Klan. “The Klan was made up more of rednecks and working class people who were very secretive about their activities. The Citizens Council went about their work quietly and behind the scenes by putting pressure on local citizens to go along with their way of thinking. It was more or less expected of us to pay our $5 yearly dues to the Citizens Council and to stand behind them. Our neighbor, Hite McLean, who was quite active in the Council and a strong segregationist, talked me into being the publicity chairman one year, though there was precious little publicity to put out.